As is the norm before BRICS summits, the BRICS Business Council met at Ufa on the eve of the summit to finalise their proposals for the leaders. The focus of their deliberations was the New Development Bank and its prospects. 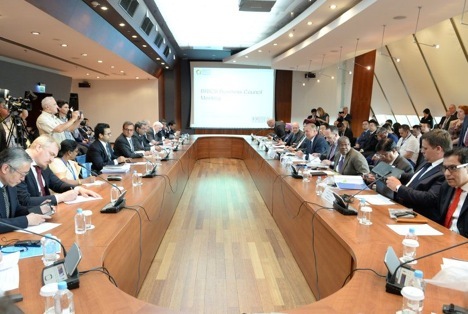 The BRICS Business Council met for a session on Wednesday, June 8 at Ufa, to finalise and approve a report outlining and summarizing action taken during the year of the Brazilian presidency. Finance ministers from the five BRICS nations also participated in the Business Council meet and will present this report to the five heads of state and government of Brazil, Russia, India, China and South Africa before the summit meeting begins on Thursday morning (9 July). The report will reflect the main concerns that need to be dealt with and outline the way ahead. The functioning of the New Development Bank (NDB) and its prospects was the key topic of discussion at the BRICS Business Council meeting. Finance ministers from the five countries, who participated for the first time at Ufa, also discussed the possibility of working with their national currencies. As Russian Finance Minister Anton Siluanov noted, the NDB was created to finance infrastructure projects. The bank’s stated capital is $100 billion and paid-up capital is $10 billion. Matching funds are provided for in the RF budget. Changes to the capital corpus will occur within five years. By the end of the year, each of the BRICS countries will present project proposals for funding, from which the NDB will choose the most efficient and workable ones. They will receive initial financing early next year. There are a considerable number of projects. There are also those which have already been outlined in detail. A year ago, at the summit in Fortaleza, Brazil, the Russian side brought 37 proposals for projects finalised by the Russian Chamber of Commerce and Industry and the Ministry of Economic Development. Among these are Rostechnology projects related to prefabricated port facilities, which are interesting for all BRICS countries. There is a proposal from Brazil on construction of a transoceanic route that would traverse through Brazil, Argentina, Paraguay and Chile. Among the chosen projects could also be construction of a high-speed railroad line from Moscow to Kazan, conceived as a segment of the Moscow-Beijing route. Siluanov also noted that the BRICS NDB would work in quite a competitive environment, as it was created after the Asian Infrastructure Investment Bank with the same capital, and a similar set of objectives, particularly whether it is possible to jointly implement large-scale infrastructure projects that several countries are interested in. Like Russia and China, for example, and development of the Economic Silk Road. On the BRICS NDB’s agenda is developing simpler decision-making procedures. They should not be protracted and bureaucratized, and positively different from those of other financial institutions. Sergey Katyrin, Russian Chamber of Commerce and Industry President and Chairman of the Russian part of the BRICS Business Council said members of the Business Council think it is necessary for the business community to have representation in the NDB’s management bodies, to allow for greater transparency and some influence over how projects will be reviewed and financed. Among other problems discussed at the Business Council was improving the business climates in BRICS countries; improving the visa regime; simplifying transit for entrepreneurs, goods, services, and funds; converging standards, technical regulations, and other licensing procedures. According to Katyrin, two more working groups have been added to the five that are already working; for agriculture and to eliminate administrative barriers. The last group is cross-cutting; proposals from all other working groups would flow into this group as various non-tariff and other barriers interfere with ease of doing business. Development of small and medium businesses was another focus. This segment is not so well represented in the Business Council, but there is considerable interest in developing contacts among them in all five countries. Small businesses are primarily regional, even municipal, but many such companies can export and create joint ventures, underscored Katyrin.